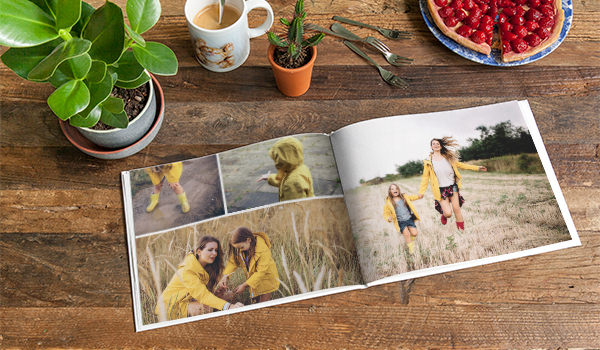 For sweeping landscape shots and impressive portraits, get creating your extra-large photo book. It’s the perfect way to display those once-in-a-lifetime views. And if you need a professional portfolio to show off your best work, it’s the ideal size for that too. They also make amazing gifts and gorgeous wedding albums. And there are loads of fun ways to customise your book and make it your own. Head to our creator tool to get started and explore all the ways you can personalise your extra-large photo book. It’s so easy to start creating your photo book. First, go to our online or offline creator tool. You’ll see a range of books, including small, medium, large and extra-large. Click the ‘XL’ photo albums option to filter the results, and then you can choose the format you want. To show off the best panoramas from your last adventure, why not pick the XL square photo book in premium layflat? And for those big group shots of your friends and family, go all out with an XL landscape book. Now you can get creative and get customising. In our creator tool, you can experiment with as many different image layouts as you want. Maybe try a double-page spread in an extra-large layflat photo book. You could also make a montage with our mosaic grids in a landscape book. And to personalise your album, you can add backgrounds, masks and text too. When you’re happy with your design, click ‘add to basket’. Here you can add a title to your cover and select gloss paper to make the colours pop in your pictures. Then you’re ready to order, and we’ll send your extra-large photo album to you.